Global super fine aluminum trihydroxide market expected to reach USD 560 million by 2025 and is growing at a CAGR of approximately 1% between 2017 and 2025. The report covers forecast and analysis for the super fine aluminum trihydroxide market on a global and regional level. The details about the market opportunities are discussed in the report. The super fine aluminum trihydroxide market has been analyzed using Porter’s Five Forces Analysis. The market is segmented on the basis of the method of preparation and end–user which, in turn, is bifurcated on a regional level as well. The report deals with the in-depth quantitative and qualitative analyses of the super fine aluminum trihydroxide market. Aluminum trihydroxide, Al (OH) 3, also known as aluminum hydroxide, is a non-abrasive powder. Aluminum trihydroxide is found naturally as the mineral gibbsite. The super fine aluminum trihydroxide is widely used as a flame retardant in the rubber and plastic industries. For the applications such as wastewater treatment and water purification the super fine aluminum trihydroxide is used. Super fine aluminum trihydroxide is used as raw material in chemical and glass industries. The super fine aluminum trihydroxide is also used in electronic industry for manufacturing the wires, cables, electronic devices, etc. 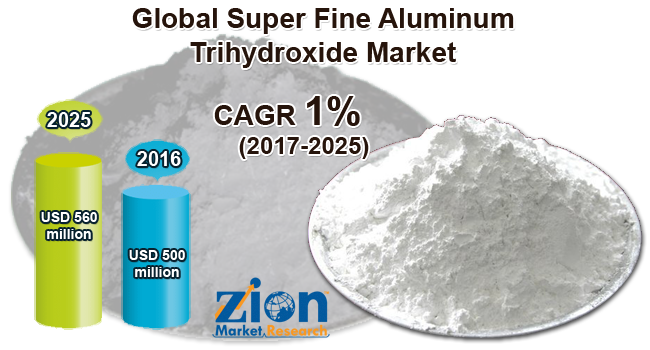 The global super fine aluminum trihydroxide market was valued at around USD 500 million in the year 2016 and it is expected to reach approximately USD 560 million by 2025. The global super fine aluminum trihydroxide market is expected to grow at a CAGR of approximately 1% between 2017 and 2025. The major factor driving the growth of super fine aluminum trihydroxide market is the increasing demand for the flame retardant plastics. The super fine aluminum trihydroxide is an excellent smoke suppressant. It acts as a smoke suppressant in a different range of polluters. Hence, the aluminum trihydroxide is widely used as a flame retardant. The emergence of stringent safety regulations in various industries is propelling the demand for super fine aluminum trihydroxide globally. Moreover, the availability of super fine aluminum trihydroxide at an affordable price is expected to propel the growth of super fine aluminum trihydroxide market. However, lack of awareness about the benefits of aluminum trihydroxide in some of the developing countries may hamper the growth of the super fine aluminum trihydroxide market. The mechanical method accounted for a major share of around 85% in the global super fine aluminum trihydroxide market. A mechanical method for preparation of fine aluminum trihydroxide is cost-effective, and hence it is expected to register the highest growth rate over the forecast period. Mechanical methods involve mechanical forces such as compression and shear forces that facilitate particle size reduction of bulk materials. In the chemical method, catalyst or chemical agents are used for the production of super fine aluminum trihydroxide powder. The electronic industry dominated the global super fine aluminum trihydroxide market with the share of around 30% in 2016. In the electronics industry, super fine aluminum trihydroxide is widely used for manufacturing of electronic products such as electronic sealing material, electronic wires, low smoke halogen cable material, and other products. Increasing use of aluminum trihydroxide in the electronics industry for various purposes is expected to keep the segment dominating in the coming years. The chemical industry segment is expected to register the highest CAGR growth during the forecast period. The wide application of aluminum trihydroxide for wastewater treatment and drinking water purification is expected to significantly contribute to the growth of super fine aluminum trihydroxide market globally. In the rubber and plastic industry, the super fine aluminum trihydroxide is widely used as an insulator, flame retardant, foam insulation, and silastic. The other end-user industries include glass industry, papermaking industry, etc. The Asia Pacific is expected to register the highest CAGR growth of 1.3% during the forecast period. The region accounted for the highest market share of around 43% in the global super fine aluminum trihydroxide market in 2016. In the Asia Pacific, China accounted for more than 55% of market share. China is the largest producer and consumer of super fine aluminum trihydroxide. Different international ventures are making high investments in the chemical companies that are based in China thus positively contributing to the market growth. After China, India is expected to register a good market growth during the forecast period. The strong consumer base and the growing economy are factors that are influencing the growth of super fine aluminum trihydroxide market in India. In North America, the U.S. holds the dominant position in the super fine aluminum trihydroxide market. In Europe, the aluminum trihydroxide market is expected to grow at a good rate owing to the presence of a large number of chemical suppliers and producers of alumina in the region. The report includes detailed profiles of the prominent market players that are trending in the market. The major players that are compiled in the report include Albemarle Corporation, Oyak, Huber Engineered Materials, Aluminum Corporation of China Limited, KC Corporation, and Showa Denko K.K., among others. The growing strategic partnership among the top players of the super fine aluminum trihydroxide market is expected to boost the growth of market globally. For instance, in December 2017, Albemarle launched new Granite technology to expand its FCC product portfolio. Moreover, in 2017, Almatis expanded its tabular alumina production capabilities at Falta, the specialty alumina plant in India. In February 2016, the company had expanded its production in North America.